At one point in time, Snapchat was on top of social media world. It was considered as the most innovative and modern social media platform across the globe. It easily beat out Instagram, Facebook, and Twitter. Snapchat users were eager about the app, they were far more engaged in the content they were watching. Snapchat growth was steadily increasing, but in August 2016, something happened that turned the table. Instagram introduced its new feature Instagram Stories that let users share all the moments of the day, not only the ones they want to keep on their profile. All photos or videos that are shared, appear together in a slideshow format and will become your Instagram Story. Users find it more interesting than Snapchat Stories. Snapchat user growth had decreased significantly, and Instagram Stories’ user growth was fast and nonstop. There are approximately 40 million more Instagram Stories users than Snapchat users. Both brands are now racing to develop advanced features and to copy features from each other. Digital marketers and brands are prioritizing Instagram Stories over Snapchat for effective branding and conveying their brand message. Let’s explore what made digital marketers and brands to change their preference and how Instagram Stories defeated Snapchat Stories. The simplest reason that made Snapchat Stories a less preferred choice for users and marketers is Instagram’s massive user base 700 million and the number continues. A big user base has automatically made Instagram a formidable competitor of Snapchat. Instagram Stories makers have an easy and instant access to their audiences on the platform when they post short-lived messages. More than 200 million Instagram users are posting Stories. 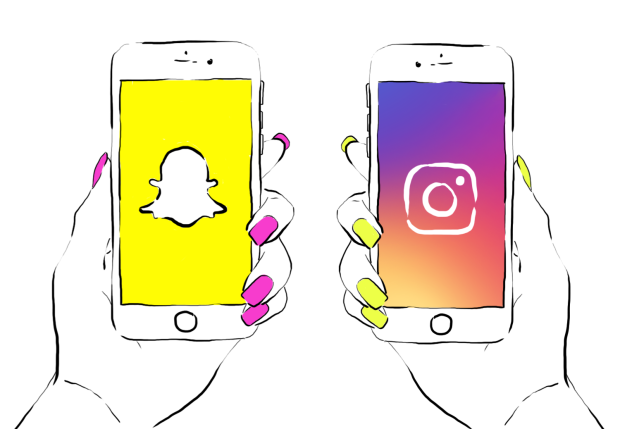 On Snapchat, brands have to create user base from the scratch, however, Instagram allows brands to reach a wider audience and engage with people on social media. Jay Curley, senior global marketing manager of Instagram believes that Instagram Stories achieve better results at a greater scale and achieve higher CPM (cost per impression) rate than usual. Because Instagram has a massive number of followers that are engaging and interacting with Instagram Stories. Instagram is part of the Facebook network, its content and ad targeting abilities are also a part of Facebook’s robust ecosystem. This clearly shows that Instagram ads can be targeted based on users’ data on both platforms, Instagram and Facebook. On the other hand, in May 2017, Snapchat launched its self-serve platform that make it easier for marketers and advertisers to purchase and create ad space on the platform. So, it makes it difficult to figure out which offers a great user experience for brands. But if we compare data of Facebook and Instagram users with Snapchat’s data which is only 166 million users, Instagram’s targeting is the best choice for brands. Instagram offers its users more flexible ad buying options. Instagram ads can easily be purchased on the basis of cost per click and cost per thousand impressions, both. This simply makes Instagram ads significantly more valuable and brands need to pay for only those ads that users actually interact with. For advertisers and marketers, it is not the ad space that matters, it’s all about the quality of data behind it. Authentic data always result in better advertising performance. Another great benefit of using Instagram Stories is the larger audience that can drive more and more traffic to your website landing pages. Social media plays a key role in driving brand awareness and Instagram Stories make it easier for brands to link to product and landing pages. Thus, making it simpler for users to find and interact with brands on their sites. Instagram offers brands a user-friendly and unified dashboard where they can check analytics of Stories and see how ads are performing, all in one single place. Marketers can check which Instagram Stories are driving more traffic to their websites. This is another reason why brands are switching from Snapchat to Instagram Stories. The option of viewing analytics and the ability to link to your product pages, blog posts and home page, so brands can drive traffic directly from social. Instagram and Snapchat are competing to innovate new features to win the race. Snapchat developed a search bar and universal Stories to help audience find new content and accounts to follow. While Instagram came up with Location and Hashtag Stories to help users discover your brand and content but with a major difference. On Instagram Stories, users can tap geotags and hashtags and navigate to find out what other users are posting about the location or particular topic. While, Snapchat users can move to the search bar to choose locations and events and see what Stories makers are posting but the difficult part is, they can’t do it directly from within the Snapchat Story they are watching. This manual step makes it difficult for brands to being found and discovered on Snapchat. This is why, Instagram has now become the more preferred choice for brands that are looking to increase brand awareness and engage a wider audience. A lack of authenticity is one of the major reasons that made brands and marketers to move from Snapchat to Instagram Stories. Snapchat forces you to pick stories to watch end-to-end before even starting, that are filled with ads or clickbait. On the other hand, Instagram users can easily jump between short-lived content on Instagram Stories, easily curated wonderful images on the Instagram feed. In addition, users can auto-advance through Instagram Stories easily without being interrupted by low quality ads. Instagram’s Explore tab has the ability to suggest new content and users, so the experience is not interrupted and overwhelmed by annoying ads. While Snapchat has the only way of monetization that lies within the Snapchat Stories and Discover tab. User-friendliness is the most compelling reason marketers are moving from Snapchat to Instagram. Because, Instagram is more user-friendly and easy to use than Snapchat. On Instagram, you can easily add new followers, view content, share stories and reply to stories. The discoverability element makes it easier to attract more and more users, and people get the most of this feature by finding and connecting with content they are interested in checking out. The power of Instagram larger network makes it easier for brands and users to get what they actually want out of social media. Users and brands both are switching to Instagram because of its seamless user experience. Just because Instagram is a perfect fit for digital marketing agencies and social media marketers, it simply doesn’t mean you should abandon your marketing efforts or completely ignore Snapchat. If you have built a massive user base there, it is advised don’t abandon your efforts on Snapchat. Look for some ways to keep your audience engaged while also building an Instagram story following. No matter if you are fully invested your digital marketing efforts in Instagram Stories or still engaged with your Snapchat followers, it is recommended to analyze the results and then make tweaks accordingly. Irfan Ak is a brand strategist, digital marketing expert and a blogger. He is a passionate digital strategist. Currently, associated with Branex – a digital agnecy. He has worked with various other brands like UI Responsive and created value for them.